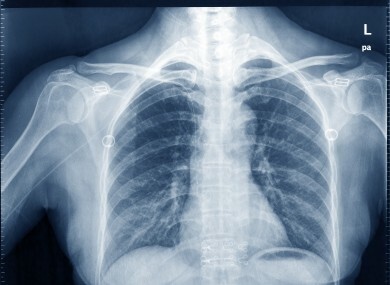 A WIDOW WHO brought a High Court medical negligence action against a consultant doctor and the HSE over a failure to diagnose her late husband’s lung cancer has settled her claim for €60,000. The action was brought by Mrs Rosarii Molloy Curran arising out of the death of her husband John Curran from lung cancer in April 2011. She had sued Dr Colm Quigley, a specialist in respiratory and general medicine at Ely Hospital, Wexford, and the HSE for alleged negligence and breach of duty of care towards Mr Curran, who was their patient between August 2009 and the time of his death. There was a failure to either diagnose, or carry out follow up tests on, or immediately investigate Mr Curran, who was a smoker, for lung cancer it was claimed. An apology to the Curran family was given in court today on behalf of Dr Quigley. Dr Quigley’s counsel Conor Halpin SC in offering his client’s sympathies to the Curran family told the court as a result of what happened changes to the system of patient management have now been implemented to ensure that what happened in this case didn’t occur again. The action came before Mr Justice Kevin Cross at the High Court this morning who approved the settlement of €60,000 plus costs. In her action Mrs Molloy Curran of Carrigmannon, Killurin, Co Wexford sought damages for the emotion suffering and psychological injury she says she suffered as a result of her husband’s death. Mrs Molloy Curran, represented by Ciaran Craven SC, claimed in August 2009 Dr Quigley diagnosed her husband as suffering from low blood sodium. Having purported to investigate Mr Curran’s condition further, no such investigations, including a bronchoscopy to look at the lungs, or follow ups were arranged or carried out. This it was alleged was despite Mr Curran’s request to Dr Quigley to do a follow up and conduct further investigations. It was also claimed between December 2009 and March 2010 Mr Curran attended at Waterford Regional Hospital for investigation and treatment for a vascular condition. Mr Curran, it was alleged, again showed signs he was suffering from low sodium in his blood, but this was not investigated or followed up. In December 2010 it is claimed Mr Curran was diagnosed by Dr Quigley as having ‘Raynaud’s phenomenon’ a condition where a person has excessively reduced blood flow generally caused by stress, and prescribed him with medication. No further investigation or follow up was arranged or carried out, it was claimed. In March 2011 Mr Curran was diagnosed with lung cancer at St Vincent’s University Hospital in Dublin. He died at home in Co Wexford on April 16th 2011. Mrs Molloy Curran claimed her husband was deprived of the opportunity and the benefits of an early, proper and prompt diagnosis and subsequent treatment of his condition. As a consequence of not getting such a diagnosis or treatment he died, it was further claimed. There was an alleged failure to have a proper regard for Mr Curran’s clinical presentation including his age, and his high tobacco consumption. The standard of care provided was inadequate it was further claimed. In a statement issued through their Solicitor Mr Dermot McNamara the Curran family welcomed the settlement and expressed their hope the case will lead to the introduction of failsafe protocols for patients awaiting vital tests. “This led to a finding of poor professional performance against Dr Quigley by the Medical Council for failing to arrange the tests, failing to recognise the tests had not been carried out, and failing to have ‘any adequate system’ in place for ‘tracking or monitoring tests’. Mr McNamara said there was no system in place for the follow-up of investigations proposed to be carried out on Mr Curran. “When tests are ordered to be carried out on a patient, there should be a clear and visible pathway to alert their clinician that the test has not been carried out.” he added. “The Curran family would urge anyone who has concerns about their treatment, or the treatment of a loved one, to follow their example and ensure that their concerns are investigated and addressed,” Mr McNamara concluded. Email “Woman receives payout of €60,000 from HSE over husband's death ”. Feedback on “Woman receives payout of €60,000 from HSE over husband's death ”.